"Don't call me nuts! YOU'RE nuts!" 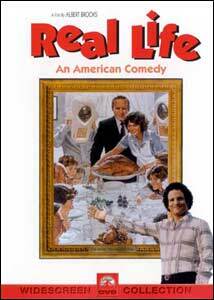 Albert Brooks' Real Life (subtitled An American Comedy) places an ordinary American family (Charles Grodin, Frances Lee McCain, Lisa Urette and Robert Stirrat) under the documentary cameras of Brooks' on-screen alter ego. The project is intended to mix sociological observation with a new frontier in entertainment potential, bringing the public "real life" in place of cinematic fakery and fantasy. Inevitably, things go wrong—family stresses are created and magnified, the project's supervising team of psychologists succumbs to internal conflict, and "Brooks" begins losing his confidence, perspective, and sanity. Looking at Brooks' 1979 first feature some twenty years later, it's amazing how many of his comic predictions have come to pass—contemporary television thrives on voyeuristic observations of "real people," preferably selected for negative chemistry and placed under as much artificial stress as the producers can induce. This mock documentary is definitely a comedy, but it has much to say about the effects of media intrusion on American life, and it says it with the edgy style bred in Brooks' early short films for Saturday Night Live, scripted with cynical wit by Brooks, Monica Johnson and Harry Shearer. This isn't a gag-a-minute movie—as is often the case with "mockumentaries," some will get the joke and others won't. Albert Brooks' humor at its most successful depends on an understanding of the filmmaking process as well as human nature, and the richness of the satire is often smuggled in beneath the pain of its characters. One comes away believing that Real Life was significantly ahead of its time—I hope this DVD release allows this smart little comedy to take its place next to This Is Spinal Tap and Waiting for Guffman, its spiritual heirs. Image Transfer Review: Paramount presents Real Life in its original 1.85:1 widescreen theatrical aspect ratio, with an anamorphic transfer. The source print suffers some emulsion and dirt flecking here and there, and the film itself exhibits quite a bit of grain and softness in several scenes. The DVD transfer looks solid enough, given the film's age and budget, with good black level, naturalistic color and no distracting digital artifacts. Audio Transfer Review: Real Life retains its original monophonic theatrical soundtrack, presented in Dolby Digital 2.0 format for ProLogic decoding to the center speaker channel. Most of the dialogue was recorded live in less-than-controlled environments, leading to substantial background noise and hiss, but the track features some degree of bass, dialogue is certainly comprehensible and the audio likely sounds as good as it ever did. A competent digital presentation of a low-budget mono soundtrack. The film's original theatrical trailer is presented in 1.85:1 anamorphic format, and it's a very worthwhile inclusion. The trailer does not use any footage from the film, but instead presents Albert Brooks promising an amazing cinematic experience. After a color introduction, the film shifts into old-fashioned red/blue anaglyphic 3D format (unfortunately, no glasses are included with the disc) as Brooks throws water at the camera and invites an elderly paddleball expert in to "amaze" the audience. Funny stuff, and one of the few examples of 3D available on DVD. This is a newly produced eleven-minute interview, featuring Mr. Brooks discussing Real Life, his first feature film. The interview is too often interrupted by panned & scanned clips from the film, and there's not as much content here as a feature-length commentary would carry, but Mr. Brooks' comments are still informative and entertaining. Real Life is a surprisingly prescient "mockumentary" by Albert Brooks, with touching and hilarious "straight" comic performances from all concerned. Paramount's DVD features a competent audio/video transfer and some valuable supplements. Recommended.